TOMORROW Newcastle United face one of the toughest tests the Premier League can throw up, but Jonás Gutiérrez has reminded them they know what is coming – and have shown they can deal with it. Unbeaten at home since February, Stoke City are notoriously hard opponents to overcome at their Britannia Stadium home. The Magpies go there without one of their first-choice senior centre-backs, although Fabricio Coloccini’s return from suspension compensates for Steven Taylor’s hamstring strain. They can also take comfort from recording one of their most remarkable results last season in the Potteries – a 3-1 victory. “When you look at the fixtures at the start of the season you know Stoke are so difficult because of the style of football they play,” said Gutiérrez, who will hand the captain’s armband back to Coloccini there. “I’m not saying it’s wrong or good because everyone has to play their football in the right way to take the points. “Stoke kick a lot of long balls and play a style which gives them a lot of points. “However, last year we went there and took the three points so we know we can get the three points there again. “Their set-pieces are so special, so good. If we concede set pieces we will know what to expect. “We have to really concentrate for 90 minutes and not concede set pieces, not give silly fouls near the box – and with Stoke the halfway line is near the box! 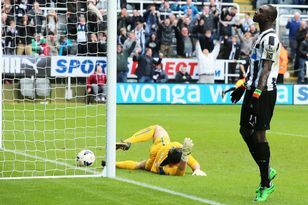 Newcastle are without a win in six games, a sequence which includes three consecutive Premier League defeats. Injuries and suspension are compounding their problems, and Gutiérrez believes unity is vital. He added: “We need to stay together. We know it’s been a tough season for us because we’ve had a lot of injuries and we don’t have a big squad. We know nothing can change (in terms of personnel). The players we have are ready to fight for the next few weeks to get back to winning ways. “The most important thing is to get back the confidence. When you have players with confidence you feel better and things are easier. “That is football. Every team have times when they are not feeling in their best form. “In the last few games we haven’t played our best football and we’ve suffered defeats. Gutiérrez played left, right and centre of midfield during the 2-0 defeat at St Mary’s as Alan Pardew shuffled his packing looking for a combination to combat Southampton. Constant change has been a theme of Newcastle’s season, with eight pre-Christmas Europa League games and the injuries they have caused necessitating constant alteration to a line-up which, in the first half of last season, was remarkably predictable. Gutiérrez acknowledges it has made life harder, but is in no mood to play the sympathy card. He said: “Of course when you play in one position with the same players and the same team it’s better for the confidence. “Hoever, we have a small squad and a lot of injuries and that’s what football’s about. “I try to do my best and I work to be better in every game. “At the moment lots of players are having to play in different positions because that’s what we have in the squad. “We have a small squad and a lot of young players trying to find their opportunities.